It’s funny how the past can turn up in the present. A couple of weeks ago I decided I’d walk, rather than drive, to a meeting in Jesmond Dene. Traipsing past the sad, burned-out husk that used to be Fisherman’s Lodge I was, Proust like, whisked back to memories of its former glory. 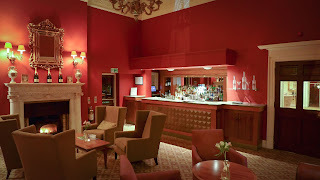 This used to be the number one place in Newcastle. I remembered, in particular, a perfect dish of enormous scallops, seared to rusty bronze, with a purée of spiced golden raisins. Given the number of restaurant meals I've consumed over the years, it takes something rather special to stand out in my mental Rolodex of plates, especially decades after the bill was settled. Later that night I got chatting to a waiter called Leo. 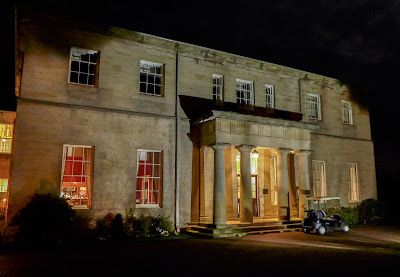 I was dining at Linden Hall, a country house hotel about 10 miles north of Morpeth, and I could have sworn I recognised the guy from somewhere. Turns out he was the very gentleman who'd served me that plate of scallops all those years ago. We got to talking about fine dining, restaurants and what a special place Fisherman’s Lodge had been. He'd worked there for ages. Suddenly I felt quite old. It’s only polite then to kick off by saying that the service at Linden Hall was excellent; present whenever required, but rather hushed and unobtrusive in exactly the kind of way you’d expect from a country house hotel with AA Rosettes. Some of the food was quite nice too, although unfortunately I don’t really need to reach any deeper into my bag of superlatives than that. 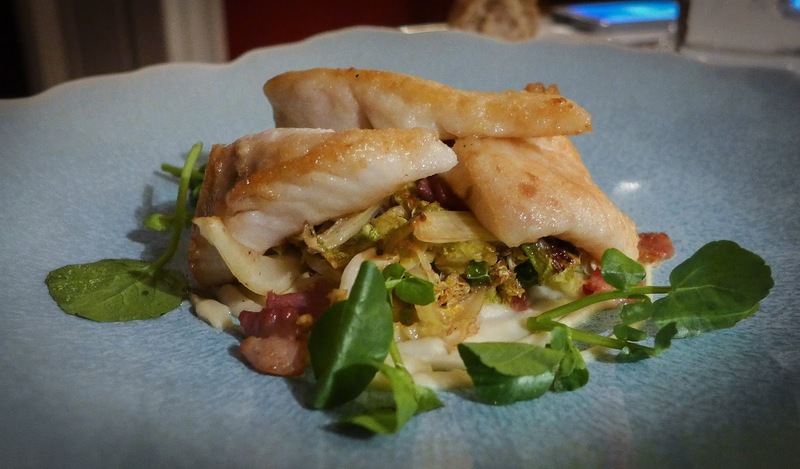 This was a meal of slightly old-fashioned affectations befitting the fairly grand but slightly jaded dining room. 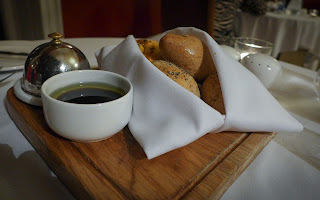 If the food had been great, bread arriving in a folded napkin basket and butter under its own dinky little cloche would have been cute. 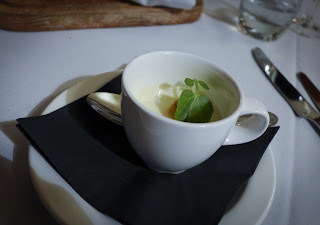 The amuse bouche of cauliflower panacotta would have been spot on. 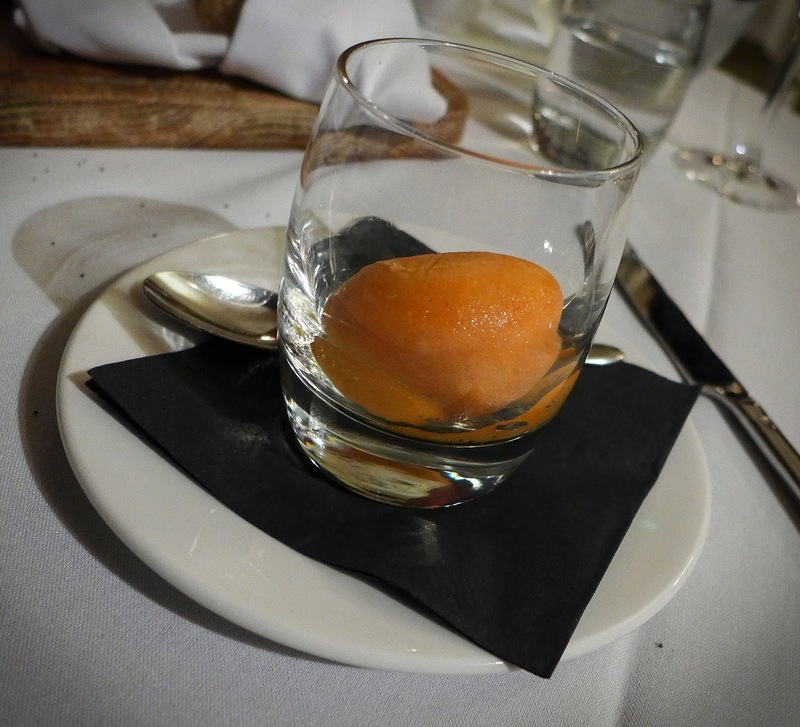 An unbidden palate-cleansing sorbet between starter and main - I can’t remember the last time I was served one of these - would have been just the thing too. 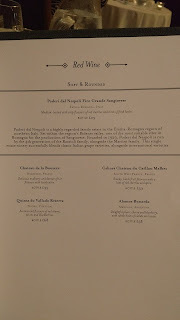 As it was, the meal itself was unspectacular enough for these extras to become bothersome eccentricities. For one thing, that orange sorbet had the synthetic twang of an Opal Fruit (that’s Starburst to you, kids), which didn’t so much refresh my palate as send it ducking for cover. Such misfires were a shame as they distracted attention from some capable treatment of good ingredients. 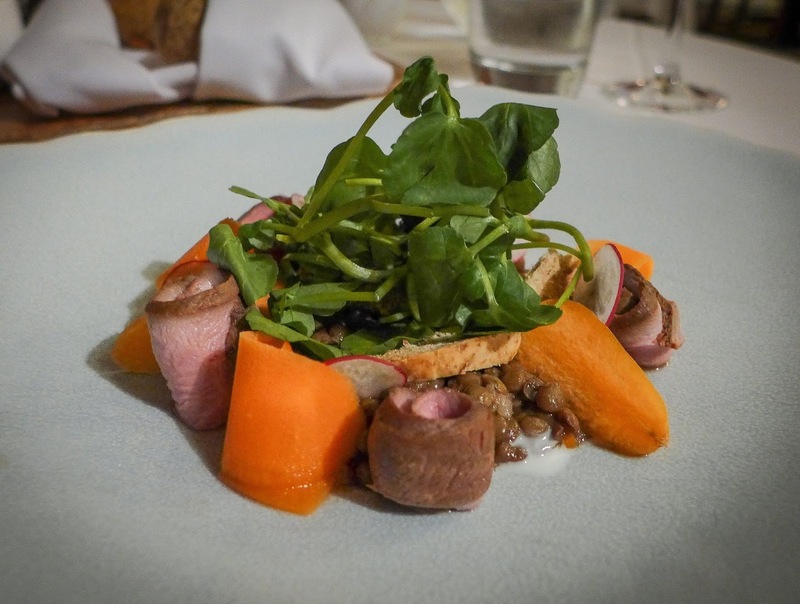 Main courses in particular were on the money. Mrs Diner’s turbot was cooked just about right and came perching on a mound of seasonally salty savoy cabbage and bacon. My roasted haunch of venison (£19.95) was blushing nicely and had good flavour, with just a hint of the taste of liver that tends to develop as the animal is hung. 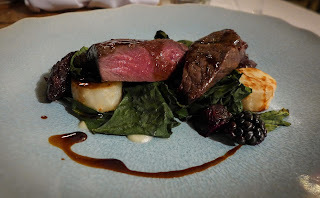 Beets, blackberries, chard and celeriac were all sensible accoutrements, although I could have done with more than the trickle of juniper jus that soon welded itself onto the over-hot plate. 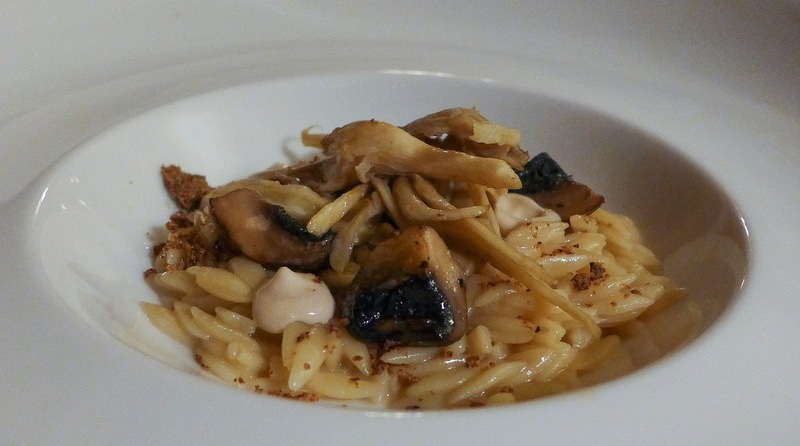 A starter of mushroom risotto wasn't risotto at all, as it was made of slippery orzo pasta. However it had decent flavour, though the effect of its advertised “cep soil” was negligible (£7.50). Another starter of smoked duck salad (£8.65) was a pretty uninspiring assembly featuring coils of meat alongside alternately pickled and raw carrots, all around a circle of puy lentils. The whole thing lacked seasoning and wasn’t helped by being served cold, the lentils in particular tasting unusually muted and dull. 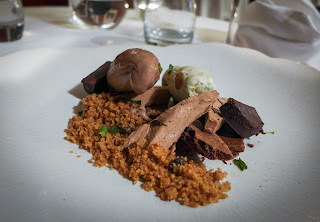 We shared a pudding of a mint-chocolate thing that followed the modern template of a bed of crumb here, a scoop or two of dairy-based something there and a few shards of textural bits and bobs hither and thither. Desserts like this might be great for restaurants - easy to prep, no a la minute cooking to bother with - but they’ll never satisfy like a bit of proper baking. When did I last get a great slice of lemon custard tart? I don’t even remember. Sigh. Wines were pretty enthusiastically marked up. Le Versant Pinot Noir went nicely enough with both my duck starter and venison, but charging £41 for a bottle when it's available at under a tenner retail is a bit ripe in my book. I guessed it was the 2016 - no vintages were printed on the wine list. That’s really not on for a restaurant at this level. Linden Hall is a grand old Georgian lump and offers certain pleasures, from the long, slow (speed bumped) drive, to the scrunch of gravel under tyre, to lounging around in one of the rather grand… well, lounges. However, this was a slightly frustrating meal. There's clearly some talent in the kitchen but it almost didn’t feel like their heart was really in it. Too many dishes tasted like they hadn't been tasted before being sent out. Years hence, if I should happen to bump in Leo again, will I remember this one? Unfortunately not. I have very fond memories of the Fisherman’s Lodge when Franco and Pamela owned it, we even had our wedding reception there. Such a shame what happened to it. Your review of Linden Hall pretty much describes the experience of eating in so many country house hotels. They never seem to get it quite right and you sometimes feel you’ve overpaid for what you’ve eaten.